Recent developments on multi-antenna transceivers (also known as Multi-Input Multi-Output systems) have shown that for the same bandwidth and power resources compared to traditional single-antenna communication, MIMO systems could increase throughput and/or increase reliability of communication (diversity gain). The extra degree of freedom (apart from time and frequency) comes from space by exploiting the possible statistical independence between transmitting-receiving antenna pairs. Apart from extensive computing requirements, engineering and physical limitations preclude the utilization of many antennas at the mobile terminal (typically no more that two antennas at the cordless phone) and therefore multi-antenna transceivers are typically utilized at the base station side. What happens when multiple antennas belong to different users? Could we exploit multiple observations from users distributed in space of the same information signal, given the broadcast nature of the wireless medium? Could we earn the benefits of traditional MIMO theory when the antennas belong to different users? In other words, this research project explores users in a network as an additional degree of freedom apart from time, frequency and space, in combination with the intrinsic properties of the wireless channel. The problem of user cooperation in wireless communication poses exciting challenges given that a) the computing (processing) capabilities of cooperating users are limited since we will assume that they are mobile with fixed computing capacity and energy consumption b) cooperation basically means that one user will use her own battery to relay information destined for a different user (while the receiver will exploit the direct and the relayed transmission) and therefore strong incentives should be inherent in the cooperative scheme and c) coordination at the network level among the cooperative nodes should be manifested, which is a radical change given the fact that all existing communication stacks have been organized according to point-to-point, non-cooperative communication. We are interested in practical schemes that address all the above issues and are applicable using existing RF hardware architectures. To investigate performance, apart from theoretical analysis, we have also implemented proposed solutions, using low cost embedded radios. Cooperation could lead to substantial total (network) transmission power savings or increased spectral efficiency (in bits per second per hertz) under certain conditions and the goal of this research is to provide distributed and adaptive cooperation algorithms that could be applied in practice. Coordination algorithms required for user cooperative communication are extensively studied. However, the notion of cooperation can be extended to other important problems: if users in a network have strong incentives to cooperate for efficient wireless communication, then they could use cooperative strategies for network time keeping and positioning. We show that cooperative communication networks could autonomously maintain a global clock (time keeping) and also be used for positioning estimation, using local computation. Therefore the network becomes the timing and positioning system with specific accuracy and precision performance, again as a function of number of users. Efficient communication and autonomous timing and positioning are considered the most important problems in wireless sensor networks. Reactive algorithms to the physics of the environment: cooperative nodes in the network adapt their behavior to instantaneous wireless channel realizations. The algorithms ought to a) scale with increasing number of cooperating users and b) require deterministic time to converge to a solution, well before the channel changes (well below the channel coherence time). Therefore, the network reacts to the physics of the environment in real time, using measured characteristics of that space. Distributed algorithms with unknown network topology: there is no central point of control that has global knowledge of the network (for example, there is no knowledge on how many nodes cooperate in the network). There is no knowledge regarding the topology of the network or distances to neighboring nodes. Realistic wireless channel modeling: the channel model used in this work is based on experimental measurements and excludes simplistic models of free space propagation or propagation within a constant radius sphere. The richness and complexity of wireless propagation make wireless communication a challenging problem so any attempt to simplify the corresponding models could provide for unrealistic results. Practical solutions for existing hardware: we tried to provide for signal processing techniques, as well as modulation, transmission and coordination techniques that could be applied in existing hardware. Therefore, we don't make the assumption that wireless "beamforming" is feasible, where different wireless transmitters "phase" their transmissions so they can add constructively at the receiver. 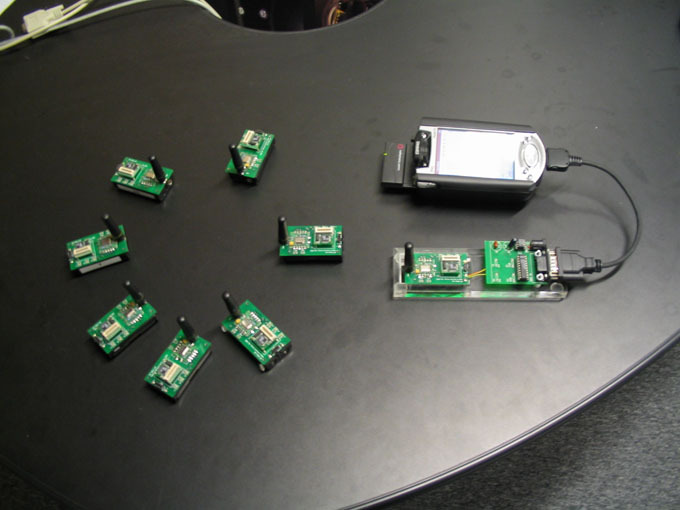 Implementing wireless phased arrays is still an open area of research. Moreover, we will not assume that any transmitter could fix its transmission radius to a given distance, since that would imply fixed radius communication. Communication range is a function of transmission power as well as wireless channel characteristics, which are not user-defined. The above components differentiate our work from existing approaches in the field, since prior art has focused on a subset of the above components. In this work, the focus is to devise system level solutions that would provide for distributed, infrastructure-free networks where communications are improved with increasing number of cooperating nodes, using simple hardware and intelligent algorithms, applicable in practice.